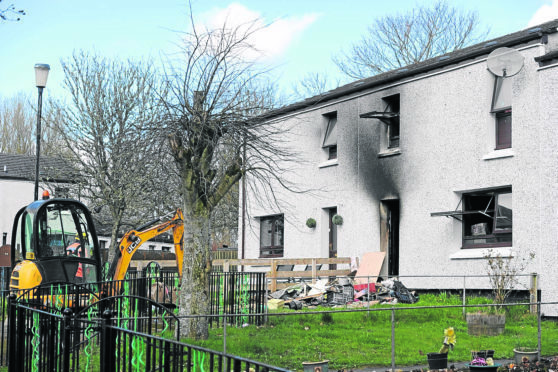 The scene of Munro Crescent house fire in Milton, Easter Ross. A family lost one of their dogs and have been left homeless after a devastating early morning fire in Ross-shire yesterday. The mid-terraced property in Munro Crescent in Milton was engulfed in flames at 5.20am yesterday morning, killing one dog and leaving another in a “poorly” state. A vet was at the scene to resuscitate the Collie cross breed and administer steroid injections. Neighbours of the unnamed family were also evacuated, with one being left homeless as a result of smoke damage. A local resident and close family friend said: “They have lost everything. They lost one of their dogs. It’s devastating. Three appliances from the Scottish Fire and Rescue Service were dispatched to the scene – two from Invergordon and one from Tain. A spokesman said: “Upon arrival, the fire was already well developed within the ground floor of the dwelling, and neighbouring properties were evacuated as a precaution by fire crews. “There were no casualties and all persons were accounted for, however sadly one dog died. The tight-knit community have since been rallying round to support the family supplying fresh clothes and essentials. The family friend added: “The fire service were fantastic, they couldn’t do enough to help. Albyn Housing are doing everything they can to find them a property in the village. They need to stay in the village; it’s quite tough going at the moment.